Southwell Minster is one of the most stunning cathedrals in England. It claims to be ‘the best kept secret among the forty-two English cathedrals’ and this is no idle pretension. Many years ago, I remember attending Evensong there. I was impressed with the service, the gorgeous setting of the Minster, the town and the local pub, which I recall was The Saracen’s Head. It is good to renew my acquaintance with this choir and their music. The singing is excellent and the organ playing second to none. The CD gets off to a great start with Elgar’s 1914 anthem ‘Give unto the Lord’. This was composed for the Festival of the Sons of the Clergy held at St Paul’s Cathedral. This service dated back to November 1655, where a collection was taken for the families of clergymen who had chosen to remain loyal to King Charles I (Martyr) and had subsequently lost their livings due to Cromwell’s ‘enthusiasm’. It is a wide-ranging anthem that exploits ‘lengthy and satisfying melodies’. After exploring the thundering voice of the Lord, and the destruction of the cedar forests the music works towards reconciliation where ‘The Lord shall give his people the blessing of peace.’ In some ways this is a ‘wartime’ work that seems prophetic of what was to happen a few months later. 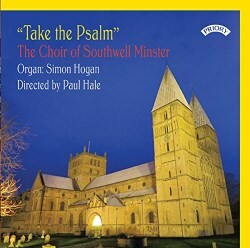 Chants for Psalm 142 ‘I cry unto the Lord’ and Psalm 66 ‘O be joyful in the Lord’ composed by one-time Rector Chori (Organist and Musical Director) of Southwell Minster, Dr Robert Ashfield are fine examples of this great and timeless Anglican tradition. They are regularly used as part of the daily cycle of Psalmody. Church musicians are eternally grateful to Eric Thiman for his many works written for the choirs and places where they sing. He composed in excess of 1300 pieces. His setting of Psalm 107, ‘O that men would praise the Lord’ is typical of his sympathetic approach to liturgical music. Sidney Campbell is a name that crops up regularly in the organ loft and choir stalls. Campbell was one-time organist at Ely, Southwark and Canterbury cathedrals. His setting of the ‘Sing we merrily’ (Psalm 81) is a vibrant, rhythmically compelling piece that has a ‘virtuosic’ accompaniment. It was written in 1962. Another chant presented here is Robert William Liddle’s (1864-1917) powerful setting for Psalm 129, ‘Many a time have they fought against me’. Liddle was another alumnus from Southwell, having served as Rector Chori from 1888 until his death. ‘Ascribe unto the Lord’ (Psalm 29) is one of Samuel Sebastian Wesley’s most impressive anthems. The part writing here is effective with a moving setting of ‘O worship the Lord in the beauty of holiness’ and the fugal ‘As for the gods of the Heathen’. The work is conceived as six short sections with a more substantial final chorus. John Joubert’s rumbustious setting of Psalm 150 ‘O praise God in his holiness’ is bold, vibrant and subtly discordant. I have not heard any music by the Canterbury-born composer Herbert Stephen Irons (1834-1905) before. Between 1857 and 1872 he was Rector Chori at Southwell. The liner-notes suggest that his best known piece is the hymn-tune ‘Southwell’, often used for words ‘Jerusalem my happy home’. The present beautiful setting of Psalm 31, v.18 ‘Show thy servant the light of thy countenance’ was recently discovered in the library at Southwell and has been edited for this recording. The programme includes three pieces of organ solo music in contrast to the choral works. Herbert Howells’ Psalm Tune Prelude, Set II No.2 is a meditation on a verse from Psalm 139: 'Yea, the darkness is no darkness with Thee, but the night is as clear as the day…' This was composed between 1938 and 1939 and was dedicated to William Harris, then organist at St George’s Chapel Windsor. It is reflective piece, even in its central climax, and displays a positive affirmation of faith that contrasts with the grief that the composer was suffering at that time on account of the death of his son, Michael. The second piece of organ music is by Andrew Fletcher (b.1950). His Psalm Prelude, clearly nods towards Howells in its meditative exploration of the sadness implied in Psalm 137: ‘By the waters of Babylon we sat down and wept’. It is a lovely piece that deserves to be better known. It is performed here by the Southwell Organ Scholar, David Quinn. Percy Whitlock’s Seven Sketches from the Psalms (in two volumes) were composed over ‘an intensive fortnight between 14 and 30 May 1934. Each piece takes its inspiration from a verse from the psalter. The final sketch is Sortie (Recessional) and is based on Psalm 68:5 ‘The singers go before, the minstrels follow after, in the midst are the damsels playing the timbrels.’ Malcolm Riley has suggested that this piece ‘owes something to Vierne’s Carillon (No. 21 of 24 Pièces en style libre (1924)’. It is a fine piece with a quiet middle section ‘worthy of Elgar’. The Sortie concludes with great power and prominent use of the tuba stop. The CD closes with Elgar’s setting of Psalm 48 ‘Great is the Lord’. This was composed in 1912 for a service commemorating the 250th anniversary of the Royal Society at Westminster Abbey. It is often used at the ‘foundation’ of a church. The progress of the anthem is divided into a number of sections, each ‘exploring an individual emotional plane’. There is music to represent the ‘woman in travail’, the sinking of the ships of Tarshish and dance music for Zion’s rejoicing. The anthem opens and closes with a ‘big ‘Elgarian tune. The liner-notes by Peter Nicholson and Paul Hale are excellent and give a brief resume of each composer and work: some dates of works are missing. There is the usual short history of the Minster choir as well as biographies of the musical director and organists. For unknown reasons the texts of the anthems have not been provided, however these are easily discovered either on-line or in the Holy Bible (paper copy). I was disappointed that details of the organ were not given. This is an excellent ‘concept album’ which explores some of the wide range of emotions and theological ideas found in the Psalms of David. Concentrating on British music from the 20th century it presents a satisfying and balanced listening experience.